Future timberline research will focus mainly on the response of timberline to the changing environment and possible feedbacks. 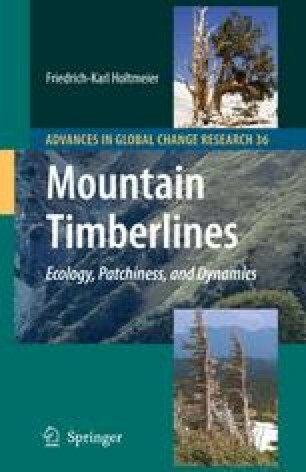 In the foregoing chapter, some aspects of past and present timberline fluctuations have been highlighted, which must be considered when predicting timberline response to climatic change. Apparently, great heterogeneity as well as great regional and local variety are the main problems. The many factors that have influenced timberline during history and those controlling timberline at present are interrelated to each other in a manifold, complex way that is hard to understand. When projecting these ‘mechanisms’ into a ‘warmer future’ we cannot be sure whether they would work in the same way as at present or as they worked in the past (Holtmeier, 2000; Giorgi and Hewitson, 2001; Holtmeier and Broll, 2005, 2007). It is still an open question which effects will result from a delayed response of high-elevation forests to a sudden climatic change (Wardle and Coleman, 1992; Lloyd and Graumlich, 1997; Peterson, 1998).